Succulents can come in many variations, but they are usually recognizable by thick, fleshy leaves and a compact shape. This week I’m sharing a tutorial for quilled succulents that is perfect for a paper craft beginner! Succulents are so sweet and a bit trendy, and they translate perfectly to quilling! I’ve seen a few examples online that are incredibly beautiful, but a little tricky. Being that I love simplifying my crafts, I spent some time figuring out a way to make quilling paper succulents that any quiller can do! I send a message of warning though: you will need a lot of paper for each succulent (at least 2 packs if the strips are the 17″ variety), and there is a bit of math involved. These succulents are created by 5 layers of increasingly larger leaves. Starting with the smallest leaves, roll a tight coil made from 34″ of quilling paper in the color of your choosing. Gently push the middle out of the coil to form a small dome. Pinch one side gently, making sure not to lose the domed shape. Apply a little white glue to the inside of each coil with a small paintbrush. Repeat these steps to make 3 domed teardrops of the same size. Once the glue is dry, the teardrop will be strong enough to start forming the succulent. These 3 leaves will be the center of the paper succulent. Glue them together in a way that shingles them around each other. While the center is drying, start rolling the rest of the leaves. Like I mentioned above, each layer will be made of 3 leaves, each layer larger than the last. The fifth layer is slightly different. In order to avoid a triangular succulent, I added three smaller leaves at the end. They were each 68″ (or 4 strips of 17″ paper). Of course, if you’re using pre-cut strips that are longer, or cutting your own, the number of strips needed will vary. Now you’re ready to finish your quilling paper succulent! Glue the next layer of leaves to the center. In order to keep the succulent with a natural, open shape, try to keep the glue towards the bottom of each leaf, and line each one up so the center of the leaf is where the two in the layer before it meets. I can’t recommend Tacky Glue enough for this! Because each leaf is only glued on the bottom, you’ll want a glue that dries quickly so you don’t have to hold each one for a long time. I used a pen or two to keep the leaves balanced in place as they dried completely. Continue adding the third and fourth layer of leaves in the same way. The last smaller layer of leaves will be glued in the space between the largest ones. This will help the succulent look more finished and more rounded. The quilling paper succulents with these size coils will measure about two inches across. But they can absolutely be made different sizes by using larger coils, or even more or fewer layers of leaves. I love these succulents in a wreath or door hanging. And they’re so lifelike in a small pot. You can make your own quilling paper pot, like the ones I made in this quilling paper cactus post. But you can save yourself a bit of time and trouble and place them on top of a real terracotta flower pot, too! 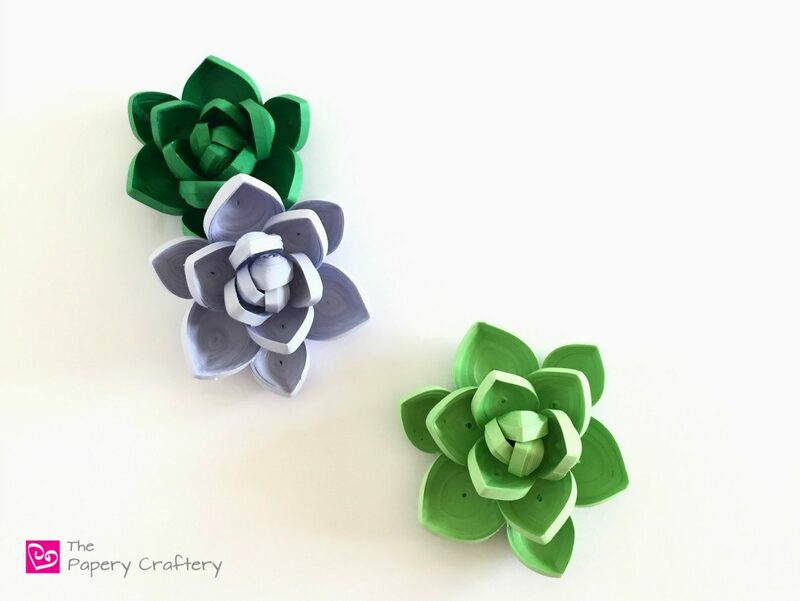 How are you going to use your quilling paper succulents? Leave a comment below and tell me what you’re thinking! These are a cute idea especially for scouts and such. I am going to suggest and see if my girls want to do it- thank you. Great idea! Quilling is great for kids! Check out my quilling basics and printables page for help getting started. OMGOSH. these are the cutest! and you don’t ever have to worry about them dying! I have a black thumb.. heh! How neat! Those really do look like succulents! I imagine making these succulents takes some patience and practice at quilling. this is so cute! i’ve never quilled – going to have to try now! Thanks Tara! If you start and have questions, don’t be afraid to ask! Awesome, Jessica! Thanks for taking a look! They can get a bit out of control! Don’t worry too much if they get a little crooked as you’re rolling the coils. They can be flattened out again after you glue the end and take it (carefully) off your tool. I hope that helps!